David Jones is the BTPA British Super Stock Champion. As he prepares to defend his title for the seventh time, David talks to Simon Henley about his tractor, ’Just Smoky’. David Jones driving Case-IH Just Smoky is pictured competing at at the European Championship Finals in August 2016, hosted by the NWTPC at Great Eccleston. 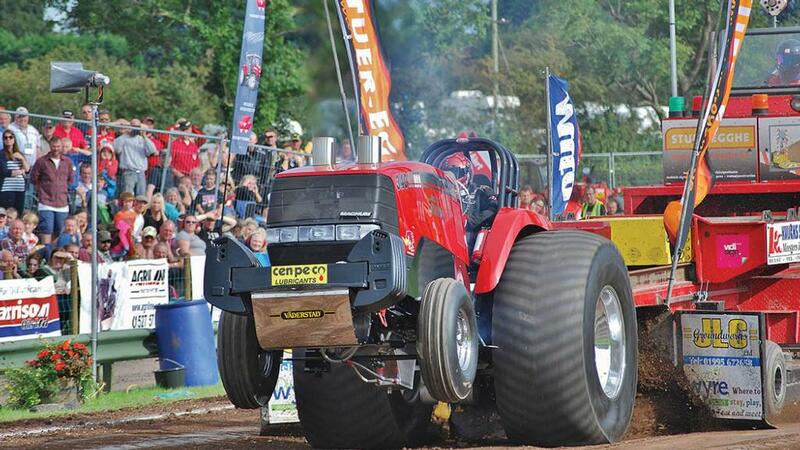 Warwickshire arable farmer David Jones has been in the tractor pulling scene his whole life. David’s father, John Jones, was a drainage contractor who, along with his brother Bill, competed at the first Royal Show tractor pulling event at Stoneleigh in 1979. Their first tractor was a Fordson Major called Smoky Joe, followed in the 1980’s by Smoky Joe MKII. After buying a new farm in the mid-1990s, the family packed-up tractor pulling as commitments on the farm took priority. Warwickshire arable farmer David Jones. 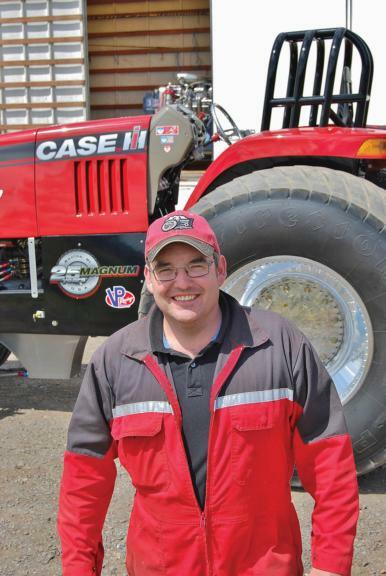 In 2004, David decided to return to tractor pulling with a brand-new tractor, a methanol-powered super stock Case-IH Magnum 340 known as Just Smoky. David is the six-time British Super Stock Champion. With the 2017 tractor pulling season well underway, the past few months have been dedicated to fine-tuning his tractor. Last year, David narrowly missed podium position in the European Super Stock Finals, placing fourth with a pull of 102.88 metres. He was the highest-placed British contender of the competition and this year he would like to do better. The engine in Just Smoky is built around a 466cu.in displacement (CID), equivalent to 7.6-litres, six-cylinder diesel International Harvester block, which has been bored-out to 600CID (9.8 litres). Super Stock Tractors run on methanol, (CH30H) which is the most basic form of alcohol. It is cool-burning and flameless, with a high resistance to pre-ignition and a lower volatility than petrol. 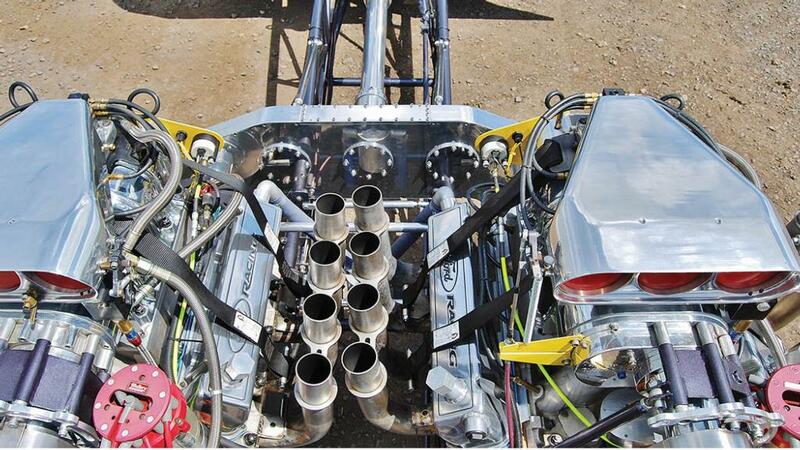 Just Smoky uses a mechanical fuel injection system, similar to the type used by drag-racers. The fuel pump, which is crankshaft-driven, operates at 250-300psi max pressure using three circuits. Methanol also has a latent heat value four times greater than petrol, with a denser intake charge which absorbs 10 times more combustion heat. With methanol engines, there is no coolant and no water pump. The engines rely only on oil for lubrication. Cylinder bores are fitted with bespoke steel liners, imported from the USA. Pistons and rods are matched pairs, machined from aircraft-grade billet aluminium. Boost pressure is applied by three bespoke-built British Holset turbochargers. The boost is two-stage, with two primary turbos feeding air into a larger third unit, doubling the intake charge to 100psi. The drivers console shares many of the same components as a racing car, including a 20-channel data logger which records vital pressures & temperatures and the performance of each pull. Dished pistons, designed to create a swirl pattern in the combustion chamber, are fitted with special piston rings which provide a total seal inside the bore. This is essential, says Mr Jones, as cylinder pressure peaks at close to 3,000psi. The cylinder head features two valves per cylinder, with hemispherical combustion chambers and a single belt-driven overhead custom-made camshaft. Huge valves are operated using heavy-duty valve springs and billet aluminium rocker arms, with needle roller bearings and roller cam followers. Fitting each valve requires surgical precision and the valve-lash on each cylinder is frequently adjusted to prevent valve damage and combustion losses. Methanol requires spark ignition, with ignition-timing duties handled by a conventional breaker-less GM truck distributor combined with a high-performance MSD ignition/coil pack producing a 70,000 volt spark through NGK spark plugs. The power produced by Mr Jones’ tractor is insane. This Case-IH Magnum 340 produces about 4,000hp at 6,400rpm, almost 12 times more than its stock diesel-powered farm equivalent. But even this is not enough for Mr Jones. “This year we have increased the power 5 per cent and added an air-intake water injection system,” says Mr Jones. This is designed to work like an intercooler, cooling the temperature of the air being forced into the cylinders and reducing the risk of detonation. The entire driveline of The Knight has been aligned and balanced using laser technology. The tractor was built on a chassis designed and manufactured in The Netherlands. The Shirley family are life-long friends of David Jones. Back when his father, John, and uncle, Bill, were still pulling, Joe Shirley was competing against them with his tractor, The Roaring Rolls. 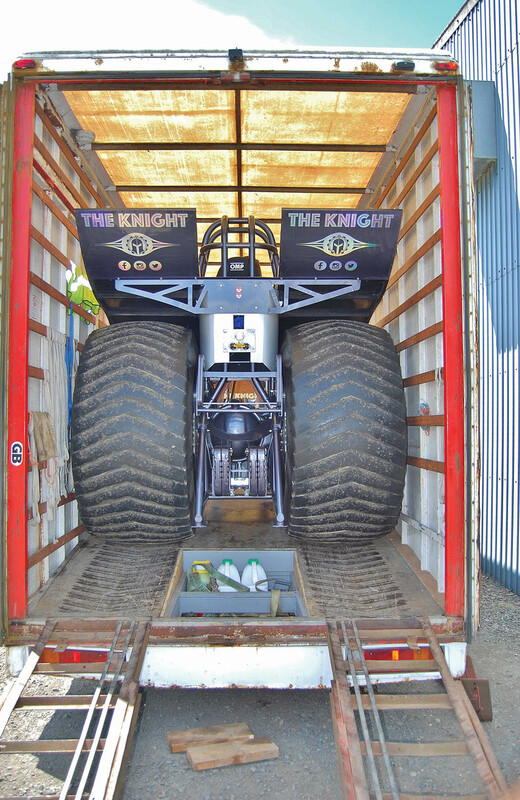 The Knight is the Shirley family’s fourth tractor and this is its second season running in the 2.5-tonne modified class. It is powered by two supercharged 460CID (7.5-litre) Ford V8 engines bored and stretched to 547CID (nine litres). 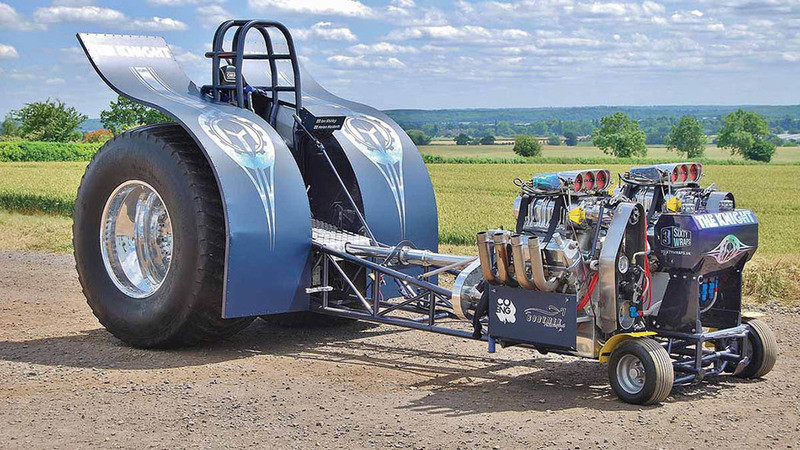 These special-build American gasoline engines, modified to run on methanol, crank out 1,800hp each at 7,000rpm. Just Smoky uses a fully enclosed, heavy-duty five-plate dry centrifugal ‘slipper’ clutch unit with a clutch pedal override. The Knight uses two slipper-clutches, one for each engine. The Knight Pulling Team use a converted furniture lorry to transport the tractor. 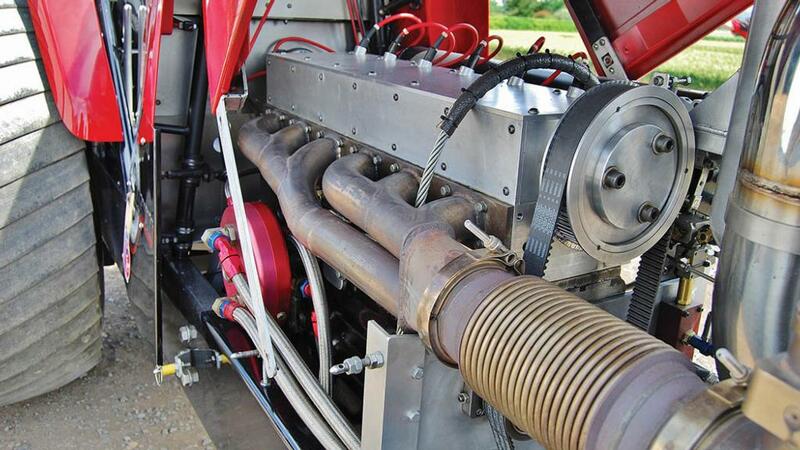 The Knight’s engines are connected using a Dutch-built cross box built entirely from billet aluminium. The cross-box is essentially a transfer box which directs the engines’ power to a single driveshaft, which drives the rear axle. The cross-box allows five different ratios to be used. A centrifugal clutch engages and disengages automatically. Clutch forks are carefully weighted in pulling tractors to stop the clutch engaging at low engine speeds. During the launching process this enables the driver to slip the clutch with the clutch pedal, preventing full engagement until the engine achieves full power. A billet aluminium transfer case, known as a cross-box, directs drive from both engines to a single driveshaft. The cross-box is a multi-speed unit which provides five different pulling ratios. Just Smoky uses a three-speed close-ratio constant mesh gearbox. Second gear offers direct drive, and is the strongest gear. Unlike the Knight, which has a laser-aligned driveshaft, the transmission is coupled directly to the differential. This is a bespoke-built 4.11:1 Eaton truck axle, with steel gears running on needle roller bearings to eliminate drag. This ensures the tractor will pull in a straight line. The tyres are 30.5 by 32 Firestone Puller 2000s. These are hand cut to achieve the correct tread profile and tyres are balanced as a pair. Once seated on their custom-made rims, the beads are tech-screwed in place. If the power of the engine overwhelms the available grip, it will simply over-rev and blow up. Engine failure occurs at 7800rpm. Driving a 4,000hp tractor requires a steely nerve. Once the tractor is attached to the sledge, the driver takes up the tension on the hitch chains. With the appropriate gear selected, engine speed is gradually increased using a spring-loaded hand-throttle which shuts down if the driver lets it go. An ideal pulling run requires the tractor to lift its nose just enough for the front wheels to clear the ground. Dramatic wheelies may please the crowd, but they are detrimental to the tractor’s performance and may cause loss of control and serious damage to the machine. Correctly ballasting the tractor to suit track conditions is essential. 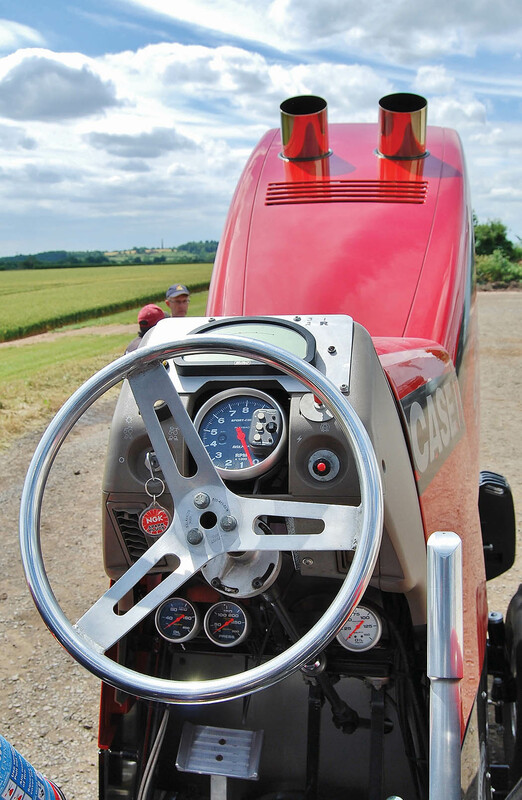 With wheel speeds topping 80mph and its forward speed peaking at 45mph, tractors cover the full pull of a 100-metre track in little more than 10-seconds, burning 30 litres (6.5 gallons) of methanol. 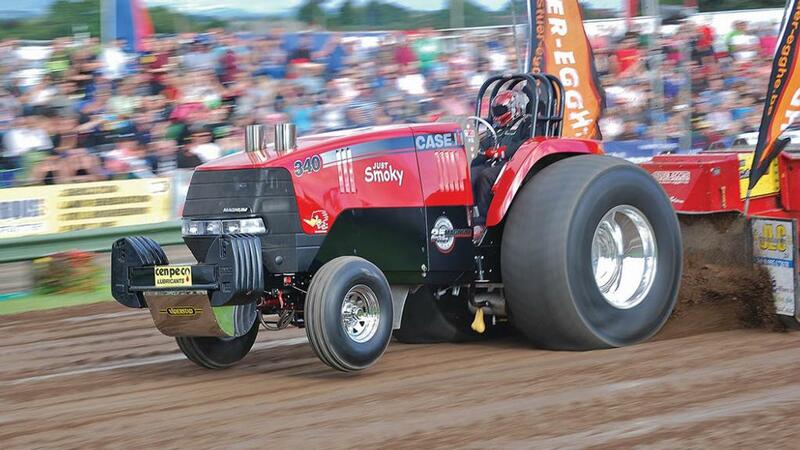 David Jones and the Just Smoky team and The Knight driven by Ian Shirley and Helen Hesketh, will be competing at the Great Eccleston Eurocup Finals, hosted by the North West Tractor Pullers Club on August Bank Holiday weekend.